Jacob Tobias was the third child of Tobias Herz and Täubchen Samuel. He was born in 1803 in Oberdreis. On March 20, 1839, at the age of 36, he married Malchen Benjamin. She was born in Birnbach, Altenkirchen in 1815, to Herz Benjamin (born in 1795) and Beile Aron (1795-1829). Jacob Tobias earned his living as a dealer and farmer in Oberdreis. Their eldest daughter Knendel “Hannchen” was born on January 24, 1840. She married her cousin Jacob II. Tobias, son of her uncle Herz Tobias. In 1864, she gave birth to twin daughters, Amalie and Helene, who died in infancy the same year. On March 26, 1866, only nine months after the birth of her son Hermann, she died from tuberculosis. Her husband was not able to care for the baby boy and gave him to his sister Fanny. The second child of Jacob and Malchen was Tobias Tobias, born on March 8, 1842. He married Karoline Baum of Osann-Monzel on Mosel. The couple lived in Oberdreis and had four children. Their eldest daughter Amalie was born on June 25, 1873. She lived as a single woman in Ruttershausen, Hesse, and was deported to Theresienstadt in 1942. She died there on May 30, 1944. Her brother Sigmund was born in 1874, and died in 1900. Her sister Thekla was born on December 24, 1876. She had an illegitimate daughter named Ottilie, born at her Aunt Bertha’s home in the Netherlands in March 1895. Ottilie died in May 1896. Thekla married Robert Herzberg of Goslar. Robert ran the cinema “Zentral” and Thekla ran a shop for fashion accessories, the “Fürst Bazar,” both located in Goslar. Thekla and Robert’s son Julius, born on July 25, 1913, married Anita Liegner of Cottbus. They had one daughter, Brigitte, born on January 2, 1936. The family was deported from Cottbus to Warschau in 1942 and disappeared. Their daughter Miriam „Meta“ was born on April 20, 1911. She married Ernst Rothmann of Berlin. They were founding members of the Hachshara colony Groß Gaglow near Cottbus. Ernst, Meta and her parents emigrated to Argentina. Thekla died in Buenos Aires on June 4, 1952. The fourth child of Tobias and Karoline was Rosa, born on August 25, 1881. She married Albert Ermann of Wittlich and had two children: Hans Siegfried (1914-2002) and Meta (1916-1986). Rosa perished in Theresienstadt on December 8, 1942 as well as her husband Albert on August 11, 1944. There is an interview Hans gave in 1981, talking about his childhood in Wittlich, his time as a teacher in Berlin, his emigration to Palestine in 1938 and to the United States in 1954. Karoline Tobias died in Oberdreis on April 26, 1917, and her husband Tobias Tobias died on November 11, 1922. 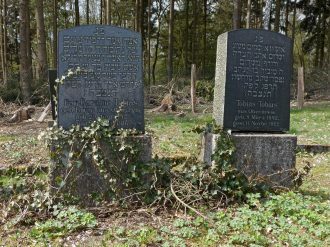 They are both buried in the Jewish cemetery of Puderbach. On January 4, 1845 Caroline, the third child of Jacob and Malchen, was born. She had an illegitimate daughter named Amalie, born on December 16, 1874, in Oberdreis. She moved to Hattingen where her younger brother Samuel lived, but her child died at only five months old. In 1878, she married Levi Müller. Their son Siegmund was born on September 9, 1881 in Gelsenkirchen. He became a pediatrician in Berlin. Siegmund was married three times and had three children. In June 1938 he commited suicide because he was said to be arrested the next day. Caroline’s brother Samuel was born on October 6, 1847 in Oberdreis, and married Elisabeth Bertha Eichberg of Osterspai on Rhine. The pair moved to Hattingen, a small town at the fringe of the Ruhr district. They had nine children of which four died in infancy. Samuel was a trader of different goods like toys, scrap metal, furniture and cigars. 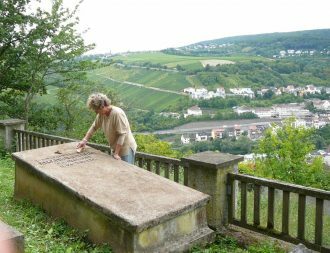 Bertha died on March 5, 1893 in Langenberg, a neighboring village of Hattingen. After that, the family moved to Gelsenkirchen, where Samuel married his second wife, the widow Sophie Joseph née Isaak of Steele. They lived in Königssteele since 1895 and they had four children together. In 1903, they moved to Recklinghausen. Samuel died on February 27, 1927. Herz “Hermann” was the fifth child of Jacob and Malchen. He was born on August 6, 1850, in Oberdreis and became a tin smith by profession. He married Regine Eichberg of Osterspai, a cousin of Samuel’s wife. They lived in Bacharach and had four children: Amalie was born on July 6, 1879. She had an illegitimate daughter named Toni, who was born in Silvolde, Gelderland at her Aunt Bertha’s home on December 22, 1899. Amalie left Toni in her Aunt’s family and went back to Germany. She married Walter Georg Peters. They had a daughter named Berta, born on March 15, 1919 in Bingen. She married Benno Gumbrich in Stuttgart in May 1937 and they emigrated to the US in February 1938. She died in Los Angeles on November 6, 1976. Amalie died in 1940 in Bingen. Julius was born on July 15, 1883 in Bacharach. He married Clemence Wolff and died only five days after her on January 17, 1923. Both are buried in Saarlouis. Siegmund was born on September 13, 1887 in Bacharach. He married Johanna Wolf in Mainz in 1916. They were divorced in 1919. On August 10, 1916 their son Kurt was born. He married Adele Jung of Frankfurt. They got a son named Sally on April 19, 1942. Johanna, Kurt, Adele und Sally were deported to Treblinka on September 30, 1942. Siegmund was in South France at the time. On August 11, 1942 he was taken from the camp Rivesaltes to Drancy and from there deported to Ausschwitz on August 14, 1942. The youngest daughter Berta was born on November 17, 1892, and died on July 25, 1918. Regine passed away on June 9, 1917, and her husband Hermann died on January 17, 1922. They’re all buried in the Jewish cemetery of Bingen. Amalie’s daughter Toni married Abraham Cohen of Arnhem on February 16, 1921 in Wisch, Gelderland. They ran a coffeehouse at Wielakkerstraat 16 in Arnhem and had eight children. Emanuel was born on May 21, 1921 and perished in Middle Europe on March 31, 1944. Daughter Emma was born born in October 1931 and died a year later. The rest of the family was killed in Ausch­witz on January 21, 1943: Bertha (June 5, 1924), Philip (April 3, 1926), Marianne Rosalie (September 27, 1927), Asser (August 21, 1929), Ida (November 23, 1932) and Karel (May 18, 1935). Bertha Tobias was born on October 29, 1853 in Oberdreis and married Asser Wolf of Silvolde, Netherlands. Bertha and Asser had four children. Bertha Tobias Wolf died on August 27, 1927 in Silvolde and is buried at the Jewish cemetery of Terborg. Jacob and Malchen had two additional children: Abraham (1856) and Elisabeth (1859, died the same year). Malchen died in 1861 in Oberdreis and her husband Jacob in 1864. Both gravesites are not found.